Whenever I mention UFOs on the blog, I get a fair number of rabid comments calling me names, attacking me on small details while ignoring the big picture, and so on. Most of these come because of a simple statement I need to repeat often: astronomers report very few if any UFOs because for the most part, we understand what we’re seeing in the sky. When we see a satellites, a glint off a distant airplane, birds, astronomical objects, lightning, or meteors, we can generally identify them and don’t need to call the police or the newspapers. The vast majority of people out there, however, are not familiar with the sky, and so when they see these things they can (understandably) freak out a little. That includes sightings of Venus and the Moon. And now the king of the planets can join that list: via Fark comes the news that residents of Washington state have been calling the police to report a UFO low in the east after sunset. And that UFO has turned out to be none other than the planet Jupiter. I’m not surprised. Jupiter is very bright and obvious in the sky right now. Since it’s getting dark earlier, people are outside when they’re not quite used to it being dark yet. And since Jupiter is rising at sunset, it’s low in the sky; people driving will see it through the window and think it’s following them. And it’s very, very common for people to think a bright object is actually a big object. It’s a perfect confluence of events to promote UFO sightings. I should’ve seen it coming! But there’s some good to come of this. For one, it means people are in fact going outside and looking up. That alone makes me happy. Also, these folks find out they’re looking at Jupiter, when maybe they didn’t even know they could see a planet at all (though I bet a few won’t believe the cops or papers). And the best part? 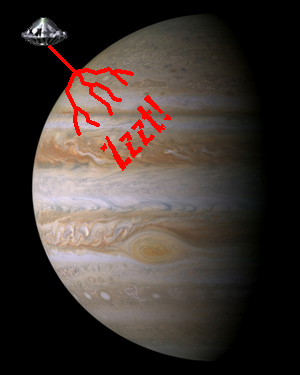 The article about the Jupiter UFO reports gives some basic info about Jupiter, too. That’s great! Kudos to the Peninsula Daily News for taking this chance to get a little astronomical coolness out there to its readers. - Aliens? Yes. UFOs? No.